As of January 1, 2019, the maximum amount of annual earnings subject to the Social Security increases to $132,900 (from $128,400 in 2018). There is no limit on the amount of earnings subject to the Medicare tax. The maximum Social Security tax to be deducted from an employee’s compensation during 2019 will be $8,239.80 (6.2% x $132,900). The employer Social Security and Medicare tax rate will remain unchanged at 6.2% and 1.45%, respectively. The employee Medicare tax rate will remain at 1.45%, except for high wage earners. High income taxpayers who have wages, compensation or self-employment income in excess of certain filing status thresholds ($250,000 if married filing jointly, $125,000 if married filing separately and $200,000 for all others), will be subject to an additional Medicare tax of .9%. For withholding purposes, wages in excess of $200,000, regardless of the filing status, will be taxed at a tax rate of 2.35% (1.45% + .9%). Only employees are subject to this additional Medicare tax. There is no change to the federal tax withholding rates for salaries and wages paid in 2019. Additionally, there will be no change in the Maryland (MD), Delaware (DE), District of Columbia (DC), Pennsylvania (PA) or Virginia (VA) withholding tables. MD’s maximum individual income tax rate remains at 5.75%. MD local county rates are unchanged except for Caroline County, which increases from 2.73% to 3.20%. DE’s, DC’s and VA’s maximum individual income tax rates will remain at 6.6%, 8.95% and 5.75% respectively. PA’s individual income tax rate will remain at 3.07% for 2019. The federal tax withholding rate on supplemental wages (e.g., bonus payments) exceeding $1 million during a calendar year remains at 37%. The rate for supplemental wages up to $1 million subject to a flat rate decreases in 2019 to 22% from 28%. PA and VA also allow flat rate withholding for supplemental pay at rates of 3.07% and 5.75%, respectively. MD rates range from 3.2% to 8.95%. The federal unemployment tax (FUTA) deposit rate is .6% for 2019. The federal taxable wage base will remain at $7,000. 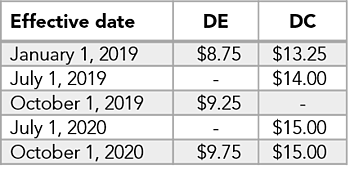 State taxable wage bases and rates for 2019 are listed on the chart below. Unemployment taxes are paid by the employer. PA employees are responsible for an additional withholding of .06% of total wages (unchanged from 2018). MD and PA require all employers to file quarterly contribution reports electronically. DC employers with at least five employees are required to submit reports electronically. The minimum threshold amount for quarterly FUTA tax deposits remains at $500.In the event you did not receive a 2019 MD unemployment insurance tax rate, it is available by calling 800.492.5524. Payment option plans are available for MD employers in economic hardship. All federal tax deposits (employment tax, excise tax, corporate income tax, etc.) must be made by electronic funds transfer (EFT). Generally, electronic funds transfers are made using the “Electronic Federal Tax Payment System” (EFTPS). Employers may arrange for their financial institutions to initiate a same-day tax wire payment on your behalf. De Minimis deposit rules still apply for employment taxes of less than $2,500 for a return period. Those who fail to use EFTPS will be subject to a 10% penalty. State EFT thresholds for tax payments are as follows: MD - $10,000 or more; DC - $5,000 or more; PA - $1,000 or more; DE and VA require EFT for payment of all state taxes. MD, DC, DE and PA allow online processing of returns. VA requires every employer to file all withholding tax returns and payments electronically. Employers should receive notification from the IRS and state taxing authorities as to the frequency of their depository requirements. Semi-weekly depositors have three banking days to make a deposit. Monthly depositors’ due dates are the 15th day of the next month for DE, MD, PA and the IRS, the 20th for DC and the 25th for VA.
Quarterly depositors may remit accumulated tax with the quarterly tax returns which are generally due the last day of the month following the end of each calendar quarter. MD and DC’s quarterly returns are due the 15th and 20th day of the following month, respectively. DE’s eighth-monthly depositors’ payments are due within three working days after the close of the eighth-monthly period. Eighth-monthly periods end on the 3rd, 7th, 11th, 15th, 19th, 22nd, 25th and the final day of every month. Employers can view deposit dates and sign up for email reminders at the IRS Online Tax Calendar through the IRS website (www.tax.gov/calendar). IRS Direct Pay is available at www.irs.gov/payments. Accelerated deposit dates are required for federal tax accumulations of $100,000, which are due the next business day. VA employers must also remit VA withholding within three days of the date withheld. MD employers who withheld $15,000 or more during 2018 and currently have accumulated $700 or more in withholding tax must make a deposit within three business days after the payroll pay date. Employers who are allowed to file federal withholding tax returns on a monthly basis may apply to MD for a waiver of the three-day rule described above. Federal rules require employers filing 250 or more W-2 forms to file electronically. DE and PA follow the federal threshold. DC’s and MD’s requirements remain at 25 or more. VA requires employers to electronically file if there are more than 50 employees. MD and PA allow withholding statements on magnetic media or other machine-readable formats. Employers required to file at least 50 W-2 forms must report the aggregate cost of employer-sponsored health insurance coverage on the 2018 W-2 form. The IRS has granted exemption to companies that file less than 50 W-2 forms until further notice. Employers with more than 50 full-time employees but less than 250 did not previously have to file reports in regard to health insurance. Employers can set up electronic delivery of Form W-2s with employee consent. Paper copies must be given without consent. The IRS will continue the pilot program to verify the authenticity of Form W-2 data in 2019. Employers who e-file W-2 Forms will have a 16-digit alphanumeric verification code for Box 9 to reduce tax fraud and identity theft. Penalty amounts for failing to provide timely, complete and correct information returns have increased for the 2018 tax year filing (W-2 and Form 1099) range from $50 - $270 per return with a maximum of $3,275,500 ($1,091,500 for small businesses). Additionally, payers are required to acknowledge their compliance with information return filings on their business income tax returns. Maryland has undergone several wage increases over the past few years but the minimum wage is currently $10.10 with no scheduled increases. Two Maryland counties have established their own minimum wage requirements. Prince George’s County has a minimum wage of $11.50. Additional increases are scheduled annually until the minimum wage reaches $15.00 for all county employees. If you have any questions, contact us here or call 800.899.4623 for help.